Estampe has online savings on windshield slogans and signs for used car sales lot advertising. Take advantage of the many different kinds of auto advertising slogans and windshield promo signs we offer designed to draw attention to your sales lot. Estampe has point-of-sale materials for automotive event marketing that will tell your prospective customers that something special is happening. Windshield advertising slogans and signs not only help motivate your customers ... but your salespeople too! Our weather resistant 5 mm coroplast Under The Hood Signs can be used to promote your dealership's sales lot even in areas with strict sign ordinances. These automotive sales signs are flexible and designed to be wedged under any hood. Under The Hood Signs are VERY visible from a distance. Plus they're convenient and economical because they can be easily moved from car to car (or truck to truck) as well as re-used over and over again. Under The Hood Signs are NOT designed to hold the vehicle's hood up or support its weight. Estampe has the largest selection of Windshield Signs for car and auto sales available online. Placing car advertising signs on the windshields of your vehicles communicates to your prospects and customers that your sales lot is well maintained, organized and lively. 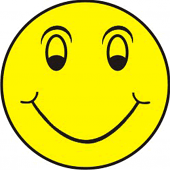 Lift the spirits and brighten the mood on your auto sales lot with these 6" Smiley Happy Face Stickers.